Worldwide, most landslides are generally triggered by rainfalls. In this paper, the hydrological model CM SAKe to forecast the timing of activation of slope movements is described. Model calibration can be performed through an iterative algorithm (named “Cluster”): in this way, optimal kernels can be refined from an initial tentative solution. At each iteration, shape and base time of the tentative kernels are optimized by means of a discretized, self-adapting approach; the fitness is computed for all the examined solutions, and new individuals are generated starting from the best kernel obtained at the previous step. The initial shape of the kernel can be selected among a set of standard basic types: (1) rectangular; (2) decreasing triangular; (3) any other geometrical shape which may sound reasonable on the base of the physical knowledge of the phenomenon. Alternatively, the kernel can be automatically optimized based on antecedent rainfalls with respect to a given date of landslide activation. 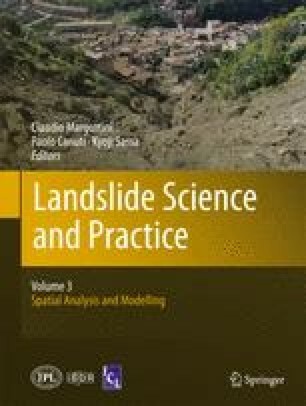 In this paper, a first example of application of the model to a large debris slide threatening a village in Northern Calabria is discussed, together with the results of a preliminary sensitivity analysis aimed at investigating the role of the main parameters.